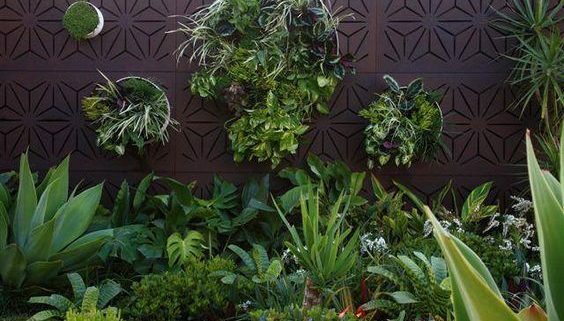 One or more wall-mounted planters are a great way to add natural greenery, bring the eye to eye level or above, and add color and texture to your design. 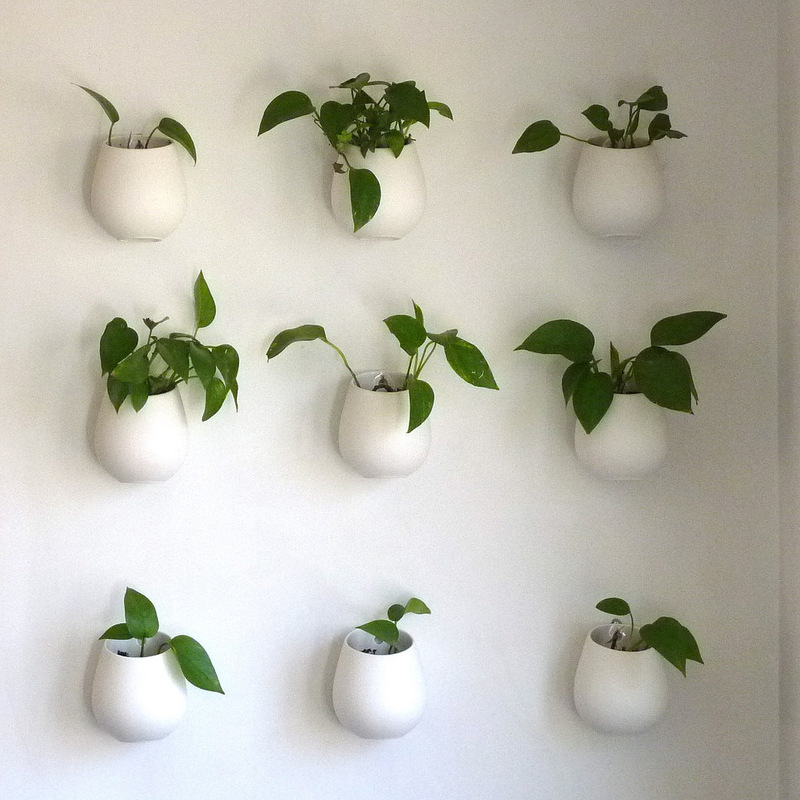 And there are so many wall-mounted planter designs and so many ways to work them into your home design! Place one wall-mounted planter on an accent wall near an entryway, place two on opposite walls to flank hallways, or cover a wall with multiple planters for a breathtaking display of greenery. Along with wall-mounted planters, terrariums are a great way to add greenery indoors without sacrificing floor space. 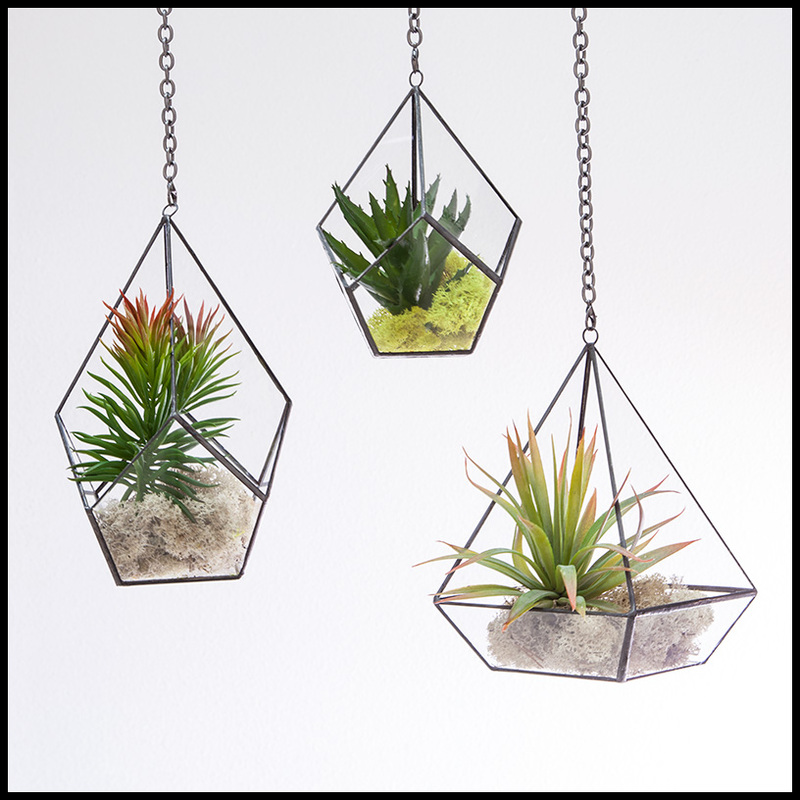 Hanging from the ceiling or placed on a tabletop or windowsill, our variety of terrariums are perfect for air plants, moss, and other low-maintenance plants. Simply spray them with a mister every once in a while to keep them hydrated. Looking for a fun project for you, your kids, or the whole family? Grow mushrooms, flowering plants, strawberries, lettuce, and other live plants in the comfort (and warmth!) of your home with a seed kit. They come complete with everything you need, whether you’re a novice or expert gardener. A great way to grow an edible garden indoors, even on the kitchen counter or windowsill, you can have fresh herbs and other foodie treats at your fingertips! Window boxes aren’t limited to the outdoors—there are just as many indoor uses for them, one of which is a windowsill garden! Grow herbs, ferns, succulents, flowering plants, and anything you like! We recommend growing hardier, cold-resistant plants, as they may still be somewhat affected by the cold coming from the windows. If it gets too cold on your windowsill, try placing your window box on your mantel, a bookshelf, a wall shelf, or on your table top for a gorgeous winter arrangement. 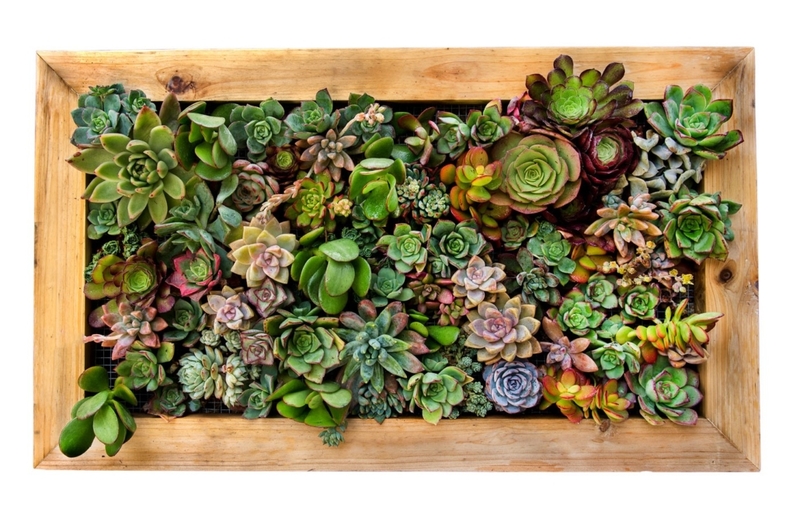 Create lush, living art with a living wall planter. Meant to be enjoyed both indoors and out, these living walls are perfect for shallow-rooted plants, as they come with a moss barrier that carries nutrients needed by plants, and absorbs water and light needed for healthy plant growth. Create your very own, one-of-a-kind plant art in endless designs and colors! Want More Indoor Gardening Ideas? For more ideas or to order gardening tools for your next indoor project, give us a call at 1-800-896-0978 or visit us at www.HooksandLattice.com. Wondering what’s hot in gardening for the new year? We’ve compiled some of the new year’s trends from top gardening experts for you so that you can start 2018 off right. Happy planting! 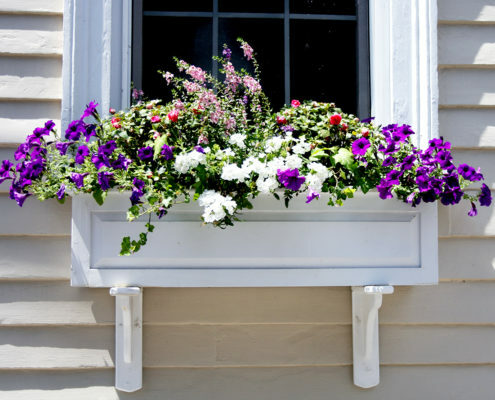 Adding window flower boxes to your outdoor space can instantly transform your home from boring to brilliant, sending curb appeal into the stratosphere. 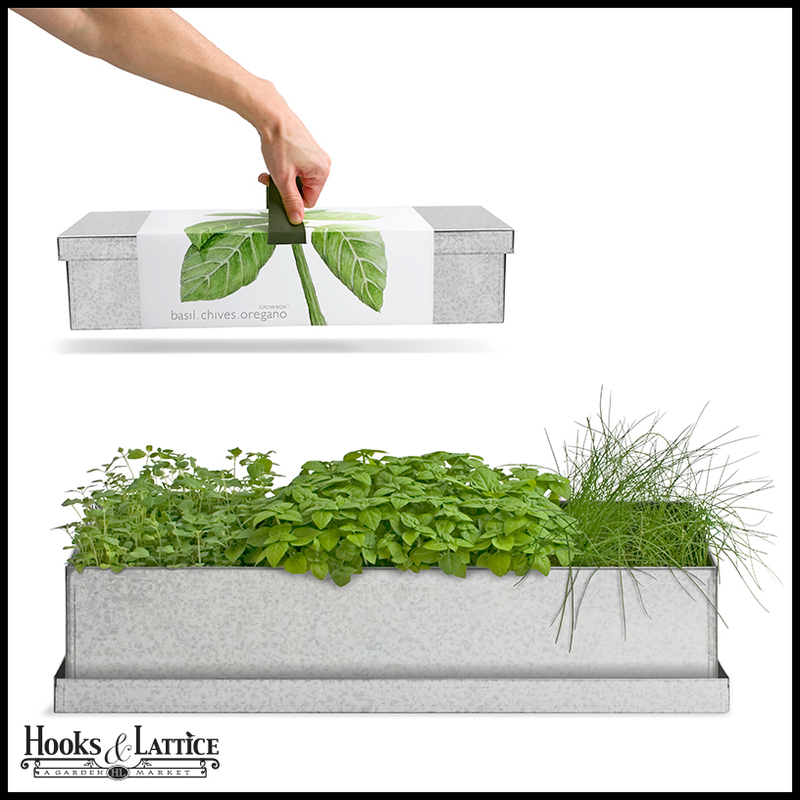 At Hooks & Lattice, we offer the best selection of stylish window boxes you’ll find anywhere. 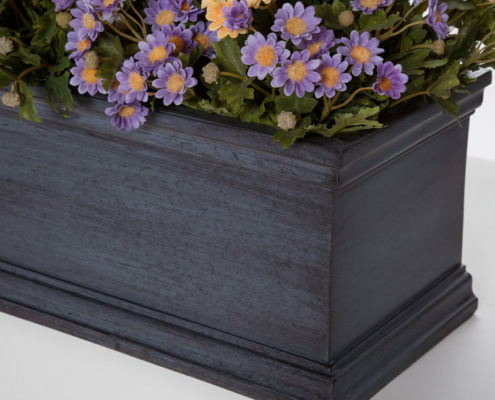 We’re proud to introduce our new Wayfarer wrought iron planter boxes to the collection. Like the popular European and Arch window boxes, the Wayfarer window planter draws inspiration from elegant Tuscan design. 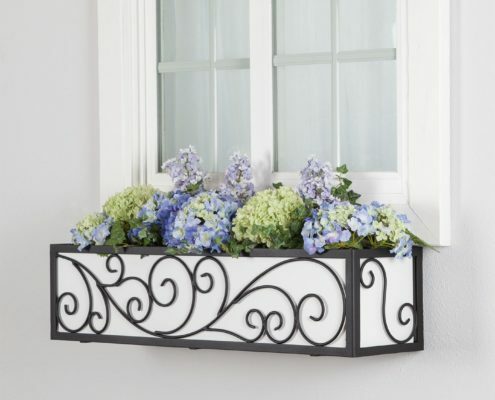 True to the style, this window box is all about wrought iron, flowing lines, and earthy elegance. And the ornate scrollwork adds a touch of whimsy. All three styles of window box can lend rustic Old World charm to your façade. To get the quintessential Tuscan feel, fill your Wayfarer planter with a combination of lavender, rosemary, and sage. The classic wrought-iron look has been popular for ages, but when constructed in the classic way, iron outdoor accessories won’t last for ages. Our Wayfarer planters are handcrafted using heavy-duty steel. Stronger than traditional wrought iron, these durable planter cages will last for many years while still giving you that timeless look. To make them even more fit for outdoor display, we add a black powder-coat finish. These planters will withstand all seasons for years to come. You don’t have to live in an Italian villa to incorporate the Wayfarer window box into your décor. This window box matches with any type of architecture. And the best part? You can customize it to get the look you want. We offer eight stunning window box liners to coordinate with your cage. Among these is our popular rot-proof white PVC liner. 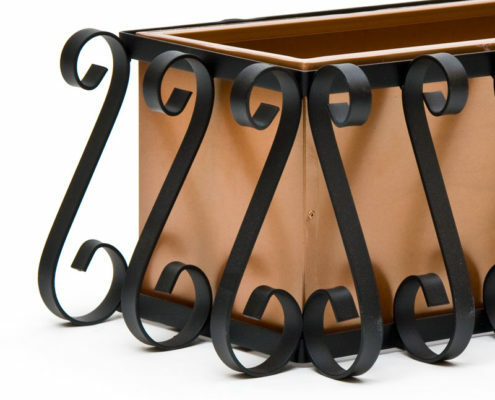 Or, to exemplify the Tuscan theme, you might choose one of our galvanized metal liners in bronze or real copper. From small kitchen windows to sprawling deck railings, these planter boxes come in sizes to fit any space. Boosting Curb Appeal is as Easy as 1, 2, 3! Choose your mounting location. Don’t just restrict them to their traditional location below your windows – these versatile planter cages are ready to hang anywhere! Give new life to empty fence lines, bare walls, and uninspiring deck railings. Install your window box. Well designed with the average do-it-yourselfer in mind, all of our window boxes are easy to mount. They include predrilled mounting tabs for both vertical and horizontal installation. Find all the hardware you need in our online selection, or choose our convenient railing brackets for decks, patios, or porches. Let your garden grow! Fill the planter liner or 8” pots with soil, then add your plants or seeds. You’ll enjoy a bountiful hanging garden in no time! For installation and planting suggestions for achieving the Tuscan look, our friendly customer service team is available via phone and online chat Monday-Friday, 7am-5pm Pacific Time. Spring has arrived, which means that it is time to get busy adding colorful floral arrangements around the exterior of your home. If you have thought about adding flowers or plants to the outside of your house, you should think about using planter boxes. They allow you to easily boost curb appeal and make your home more inviting. But, how do you choose the right window boxes to go with the décor of your home? Keep reading to find helpful window box ideas from Hooks and Lattice. When you are looking for lightweight window box planters, you may want to consider using fiberglass or PVC planters. Fiberglass and PVC are nearly indestructible and are available in a wide range of styles and designs. 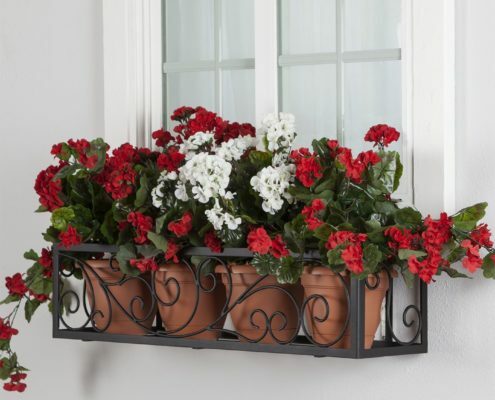 Among our most popular fiberglass window boxes are the Cleat Mount Laguna Planters. They feature clean lines that are perfect for colonial, Georgian or contemporary style homes. These fiberglass designs can mimic the look of other materials, such as our Distressed Window Boxes or Bronze Fiberglass Planters. Both of these options have a rustic look that will help draw more attention to the exterior of your home. If you are trying to dress up a brownstone or Tudor style home, you may want to take a closer look at our aluminum and wrought iron window boxes. They are also great for Victorian and Queen Anne style homes. 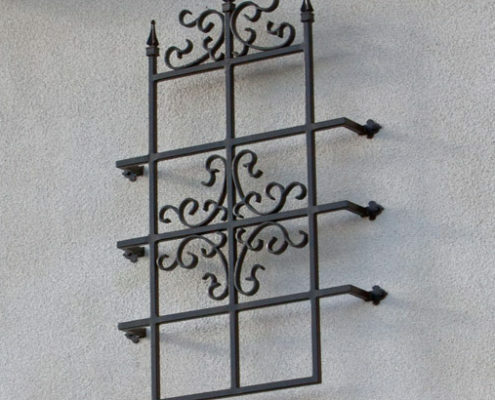 The elegant handcrafted wrought iron has an authentic look. This captures the old world charm that is popular with a variety of home styling options. European Cage: 3″ hand bent scrolls set the stage for a dramatic display. 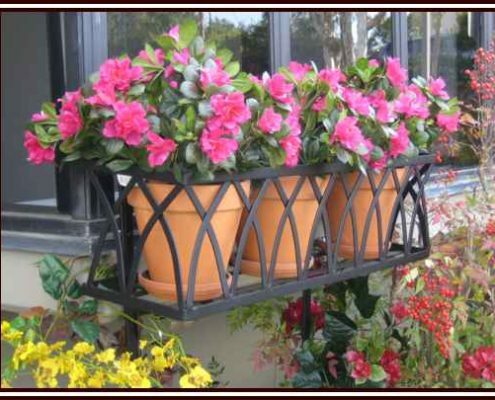 Wrought iron options include our Arch Decora window boxes with crisscrossed bars that create a sophisticated look. For a bolder appearance, examine our European Window Box Cages. These cages are hand made from wrought iron. Arrange a series of 8-inch flower pots for a custom floral display. For those wanting a more natural look, you can use planter boxes constructed from wood. Redwood and cedar are naturally resistant to bugs, insects, and rotting. This makes them suitable for year-round outdoor use. They provide an organic, eco-friendly appearance that will look great with ranch, Pueblo, cottage, and bungalow style homes. There’s really nothing like the classic beauty of white wood window boxes! Browse our handcrafted wood window boxes to bring more rustic charm to your home. At Hooks and Lattice, we have everything that you need to give your home a makeover. In addition to window boxes, you can shop for exterior shutters or browse our great selection of faux balconies and iron accents – allowing you to instantly increase the curb appeal of your home. Depending on the surface where you will mount your planter, you may need specific hardware. For installing planters along a brick exterior, purchase our 4-pack of mounting bolts. 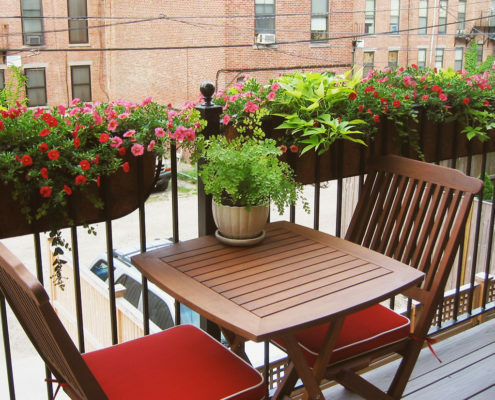 With deck railing brackets, you can install your planter along your deck, patio, or balcony railings. Carolina Hayrack Trough Railing Planters mounted using our metal brackets. Start browsing window box designs and styles today or call 800.896.0978 to speak with a representative about custom sizing options or for help selecting the right hardware. Easy to Use Window Planter Box Buying Guide Available! Hopefully, these window box ideas will give you some inspiration. Keep these suggestions in mind as you begin exploring various Hooks and Lattice window box ideas. For additional tips on selecting the right window boxes, you should check out our easy Window Box Buying Guide. There is a lot to consider when choosing window box planters. In addition to deciding between fiberglass, wrought iron, and wood planter boxes, you will need to consider the size of the planter and installation options. 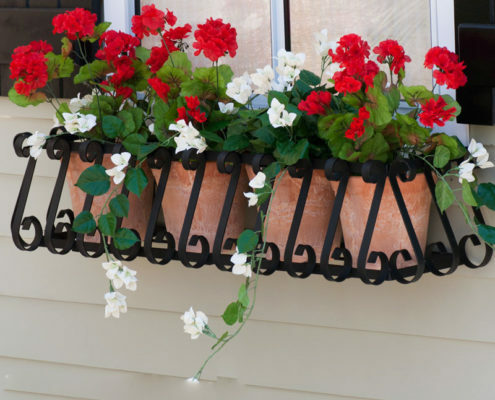 All of these details are explored in the Hooks and Lattice Window Box Buying Guide. Just follow the link provided for even more useful window box tips and ideas for choosing the perfect one for you. If you would like to find additional styling ideas, please call 800.896.0978 to speak with a design expert today. Before the weather warms up and Spring arrives, you may want to get a head start on your gardening plans. Make sure that your window boxes and planters are ready to go. This way, when the time comes, you will have one less task to deal with. When winter is at its coldest and grayest, you can find yourself looking at your house and giving a wistful sigh as you think about how you’d love to do something to spruce it up. Sadly, you have to wait for spring to arrive to get to work on improving your home’s curb appeal, right? While some improvements should be held off until spring has fully sprung, you can take steps to enhance the appearance of your exterior before winter is done. White window boxes are a great way to add to a home’s curb appeal mid-winter. Read on to learn more about adding a flower box during the cold months of the year and to discover some stylish, easy winter window box ideas.